For my fourth lesson at Stepping Stone Farm, I had my first driving lesson. Control issues. I don’t have them. I don’t want anyone in charge of me. I don’t want to be in charge of anyone. This is why I am a freelance writer and not an air traffic controller. On horseback, I have always been a laissez-faire rider. Dressage instructors and dressage horses want to interact every stride [Square Peg]. It is alien to my nature. I am much closer to the foxhunter mentality of pointing one’s horse across a field, saying “Go thataway.”, and letting them get on with it. This works in jump-offs and with strong-willed horses. It does not work with the aforementioned dressage, nor with horses who require hoof-holding. Nor does benign neglect work with driving. A driving horse with blinkers cannot see the cart. This is good because it means he will not think the cart is gaining on him to have him for lunch. This is bad because it’s up to the driver to keep the cart from crashing into the fence. If I got sloppy, the horse was not going to save my sorry self and finish jumping the combination on his own initiative. Turns have to be planned for both into and out of. In a ring, there is always another turn coming up. The entire time, I felt a terrible sense of responsibility. I had to be focused at every moment. Steadiness and consistency have never been my hallmarks. Enthusiasm and energy, yes. Even-tempered application to a task, not so much. I was exhausted. When you try to get the horse to move off by goosing the cart with your seat. When you aren’t quite aimed at the center of the outgate and you find yourself trying to shimmy the cart sideways. 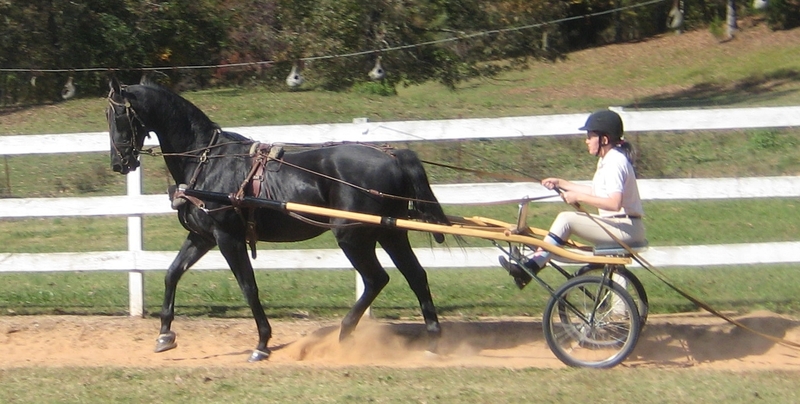 Carts are not known for performing lateral movements. The things this woman talks me into! Blurry but too cute to pass up. The b&w kitten is our feral, nonexistent 7th cat. She (? By fiat. 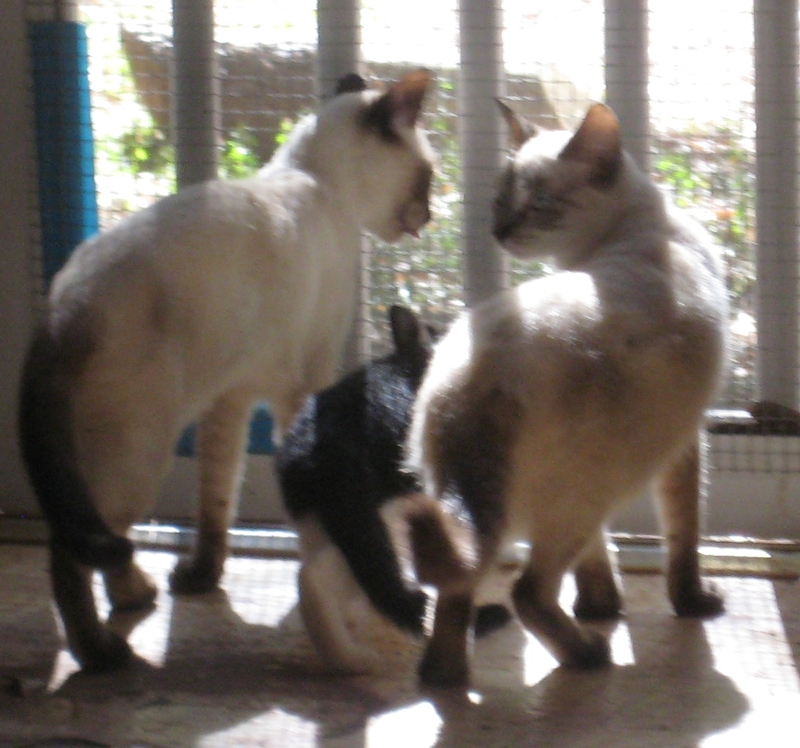 We already have 5 males) wants to be indoors & near the kittens but not in the same room as the peoples. At night, she comes out to play and snuggle with her posse. In the morning, we see her briefly as moving blur diving into one of her many hiding places. Driving sounds like Tai Chi and yoga. Yes, but with the possiblity of wiping out cart, horse, & driver. I like the idea of trying to goose the cart along with your seat! Oh, dear. I wrote reams and reams about the foibles of driving in my second book. Really, just step away. Wrecks, darling, they call them WRECKS! The wreck stories are all the pre-story before the Wee Spotted. All went well with him, mostly because I had had such horrendous experiences prior to him that I was scared wit-less. I would have a driving pony again, but it would have to be a Wee Spotted clone.